It was less than a month ago that we first reported on the disturbing events at Valley Springs Manor, the Castro Valley elder care home that “closed” with more than a dozen residents still inside. As we noted in conjunction with that story, elder abuse is becoming increasingly widespread with caregiver neglect ranking as one of the leading forms of the problem. One of the most disturbing forms of neglect, caregiver abandonment, made the news again this week. Sadly, our Oakland elder abandonment attorney has come across many cases of seniors who are unable to care for themselves due to physical and/or cognitive problems being left alone by either paid or unpaid (ex. family) caregivers. Family, friends, and community members should be aware that elder abandonment is a very real problem and should not hesitate to reach out for help if they suspect a senior has been abandoned for any length of time. Elderly Man Found at 3 A.M. Early Sunday morning police in Vallejo arrested a Brentwood man on allegations of elder abuse. As reported in the Oakland Tribune, residents in the 600 block of Alabama Street contacted police shortly after 3 A.M. to report a man banging on doors and asking to be let in to the homes. When officers arrived they found an older man, who had urinated and defecated himself, lying on the ground. The man was unresponsive but breathing. As paramedics began to attend to the older man, a second man arrived at the scene. Police eventually identified the second man as Oleander Harrison, age 40, and determined he was the caregiver for the older man, a 69 year-old described as an “extremely dependent adult.” According to the report, Harrison had driven from Brentwood to Vallejo in order to visit his girlfriend and had brought the older man along with him. While Harrison visited his girlfriend, he allegedly left the victim alone in the car for many hours. Police arrested Harrison for the suspected abandonment and booked him into Solano County jail. Under California law, abandonment is considered to be one form of elder abuse. 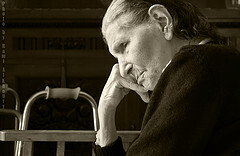 Specifically, Section 15610.05 of the Welfare & Institutions Code defines abandonment as “the desertion or willful forsaking of an elder or a dependent adult by anyone having care or custody of that person under circumstances in which a reasonable person would continue to provide care and custody.” Abandonment can involve a family member or a paid caregiver. Abandonment can be on-going and can occur in the home/care center, such as leaving an elder in their own room without the basic essentials of care. Individuals suffering from Alzheimer’s Disease or other forms of cognitive decline are particularly at risk. Abandonment can be fatal. Seniors have died of exposure after being left at an outdoor location in both extremely cold and extremely hot weather. A cognitively impaired senior might suffer health effects from being left to fend for his/herself and missing medications or not maintaining a healthy diet. As we noted in a prior post, wandering can be triggered by unmet needs, meaning an in-home abandonment could turn into a missing person case and a shorter-term abandonment (such as leaving a senior in a parked car for an extended time like in the Harrison case above) into a long-term, even permanent loss. If you suspect a senior has been abandoned by caregivers, whether it is nursing home abandonment, abandonment by another form of paid caregiver, or familial abandonment, speak up. Contact the Adult Protective Services office for the elder’s community and call our Oakland elder abuse attorney. We can help you get better care and compensation for the harm done.